A good XML Sitemap is very important for every website, especially ecommerce website. It allows Google bot to crawl and index URLs faster. And your website will have more chance to appear in the search engine result first page, which means that more customers will be attracted to your online store. 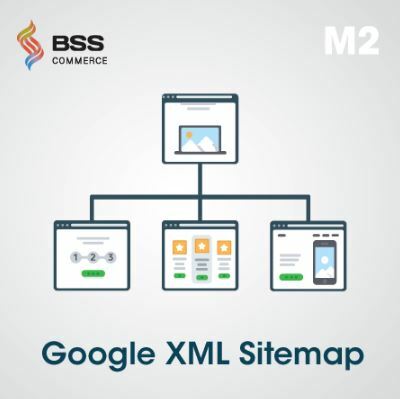 Understanding the necessity of XML Sitemap for an ecommerce website, BSSCommerce has developed Magento 2 XML Sitemap extension. This article will give you some useful information about BSSCommerce Magento 2 XML Sitemap. 2 Does Magento 2 Default Support XML Sitemap? 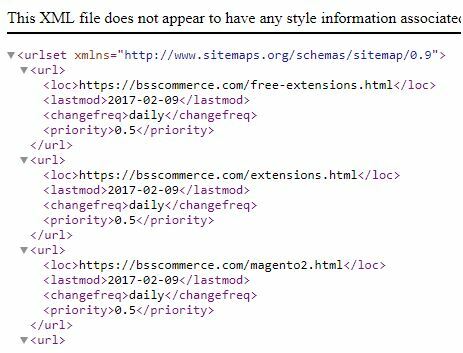 4 How can Magento 2 XML Sitemap Extension Benefit You? The main feature of Magento 2 XML Sitemap is automatically generating XML sitemap, including links to all web page in your store. Besides, this extension can divide XML sitemap into smaller sitemap files, include/exclude links to XML Sitemap, set priority and frequency for updating XML Sitemap. 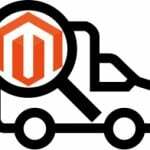 Does Magento 2 Default Support XML Sitemap? In default, Magento 2 backend have XML Sitemap function. This function allows store owners to configure the frequency and priority of generated sitemap, following Category pages, Product pages and CMS Pages. 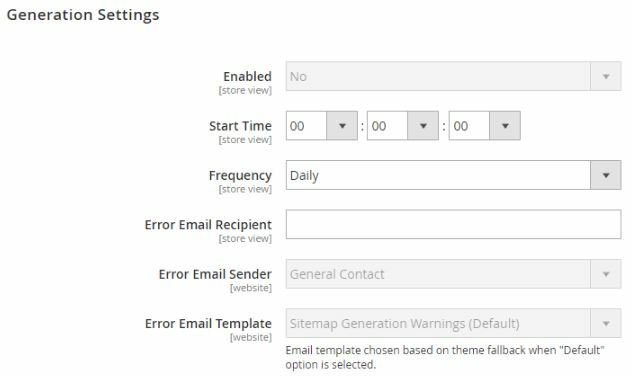 Other features of default Magento 2 XML Sitemap function are Generation Settings, Sitemap File Limits and Search Engine Submission Settings. However, the default Magento 2 XML Sitemap function has certain limitation. There are some special features that can optimize the XML sitemap, and the default function doesn’t have. For example: include/exclude links features, manually split XML sitemap into smaller sitemaps, add additional links to the sitemap. Automatically generate XML Sitemap including all links to guide Google bot index your web store faster. Exclude selected links from XML Sitemap in Magento 2 web store by top-level category, product type, product ID, manufacture or time. Configure priority and frequency in Backend to have your site updated to search engines faster. 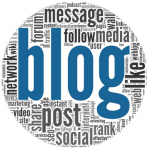 Include additional links to XML Sitemap to index the links from another site which connect to your site. 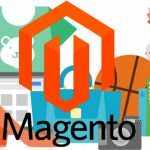 How can Magento 2 XML Sitemap Extension Benefit You? Besides basic features, now you can choose how to split XML sitemap into smaller sitemap file by Date, Category and Manufacture. Furthermore, you can exclude selected links from Magento 2 XML Sitemap to prevent crawlers index for privacy security reason. Last but not least, you can add additional links to the sitemap for SEO link building. With Magento 2 XML Sitemap extension by BSSCommerce, you can configure how the XML Sitemap is generated in the backend. 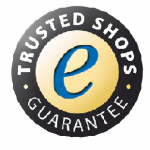 Store owners can set Priority and Frequency for the fastest index to search engines. This setting can be configured for homepage, categories, product pages and CMS pages. By configure this setting, admin can let crawlers know when to index the content and what content should be updated first in the search result. For some privacy security reason, an admin may want to prevent crawlers from index some specific links in the web store. The setting start with “Disable…” allows store owners to select a link to exclude from the XML sitemap by category, product type/ID or CMS link. In Generation Settings Options, store owners can Enable generate XML sitemap automatically by change setting to Yes. In Start Time, admin can set the update time for XML Sitemap. Frequency setting will restrict how regularly the sitemap will be updated. Error Email Recipient will receive a notification email, in case of error in the update. Error Email Sender is the store contact who send the error email. Error Email Template is the template for error email. In Sitemap File Limits Option, the Divide sitemap feature allows admin to split sitemap into the smaller sitemap.xml files by top-level category, manufacture or time. Admin can choose how the sitemap will be divided, to show crawlers the fastest way to index. You can check the submitted sitemap using this link in your browser. In Admin sidebar, click Marketing > Seo & Search > Google XML Sitemap, you can see the grid table of XML Sitemap. After complete, click Generate to create the sitemap. This XML file includes URLs, last modified time, change frequency and priority of submitted url. BSSCommerce Magento 2 XML Sitemap extension is the best solution to generate advanced XML Sitemap with more special features. With these additional features, you can build better XML Sitemap with more URLs and higher privacy security. Google bot will index your web store faster and more accurately. Your online store will have higher chance to be reached by customers. BSSCommerce offers customers to pay 79$ for Community Edition, 179$ for Enterprise Edition. The support policy including free installation and update, free 1-year support and 30 days money back.